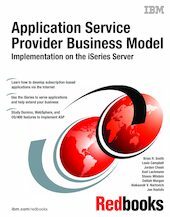 This IBM Redbooks publication shows you how to implement an exciting and new business model, called Application Service Provider (ASP), on the IBM eServer iSeries server. ASP is the "how to" base for offering outsourced access to mission-critical applications on a subscription basis over the Internet, your intranet, or via a dedicated line. This book explains how to implement the ASP business model on your iSeries server by extending the focus of other reference materials to include ASP and by including short configuration and programming examples. This book begins with a high level of what we believe currently represents the ASP business model and to what it will evolve. Next, it breaks up the application requirements of ASP into the functional components of network, accounting and billing, administration, user registration, security, service level management (SLM), high availability, and scalability. You will see how the iSeries server and architecture directly support the ASP business model. Then, this book examines the ASP application model, which supports the argument that there is no single way to correctly implement an ASP solution on the iSeries server. You learn just how to implement ASP for Domino, WebSphere, and the more traditional enterprise-out application models on the iSeries server. Learn more about how to become an iSeries ASP at the ASP Prime Solution Center.